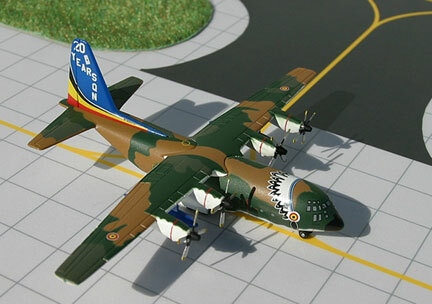 GeminiMacs Model: one limited edition collectible, die-cast military aircraft model in 1/400 scale. All construction is made of metal, of anLockheed C-130 in the Belgian Air Force. Airframe Registration, ???? This models is available as February, 2005. Hobby Masters Models: one limited edition collectible, die cast military model in 1/72nd scale of a Shenyang J-11BH, Flanker-B (SU-27) in the Chinese PLAAF - People’s Liberation Army Air Force Blue 24 2016’s Colors Scheme. Multiple types of Ordinance, Model Stand and Landing Gears all included. Airframe Registration 70100. The model is constructed of metal with some plastic parts. This product was released in October, 2018. 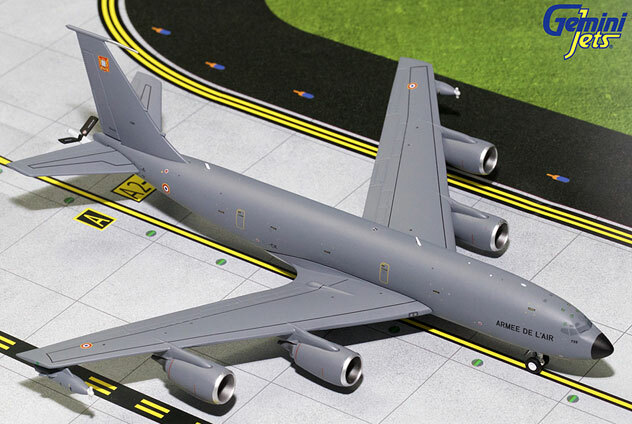 Gemini200 Models: one limited edition collectible, die cast military aircraft model, in a 1/200th scale of a Boeing KC-135FR (717-165) Stratotanker in the French Air Force - ARMEE DE L’AIR Current Colors Scheme. Model Stand included. Airframe Registration 739. The model is constructed of metal with some plastic parts. This product was released in July, 2018. 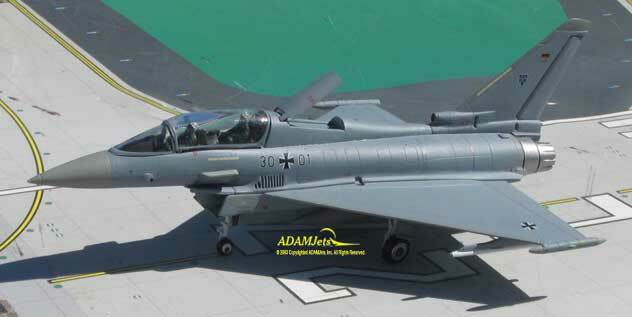 Hobby Masters Models: one limited edition collectible, die cast military model in 1/72nd scale of a Sukhoi Su-27SK Flanker-C in the Indonesian Air Force 11th Squadron, Iswahyudi AFB, Colors Scheme. Multiple types of Ordinance, Model Stand and Landing Gears all included. Airframe Registration TS-2701. The model is constructed of metal with some plastic parts. This product was released in November, 2018. 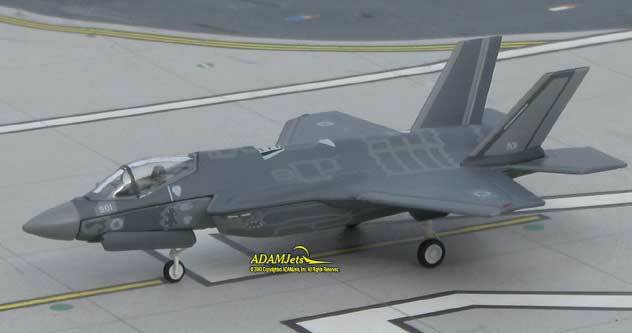 GeminMacs Model: one limited edition collectible, die-cast military aircraft model in 1/400 scale. 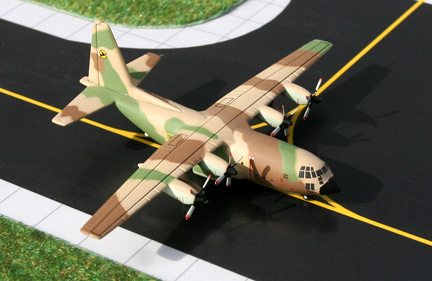 All construction is made of metal, of an Lockheed C-130H in the camouflage Israeli Air Forces (IAF) Colors. Airframe Registration, 106. 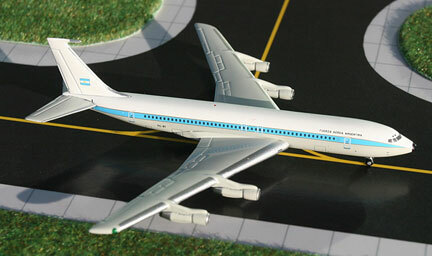 This models is available as February, 2007. Forces of Valor Models: one limited edition collectible, molded plastic with die cast metal military model, in a 1/72nd scale of a Boeing-Vertol Chinook CH-47J in the JGSDF – Japan Ground Self Defense Force 12th Brigade/ 12th Helicopter Unit / 2nd Squadron Camouflage Colors Scheme. Airframe Registration JG-2913. 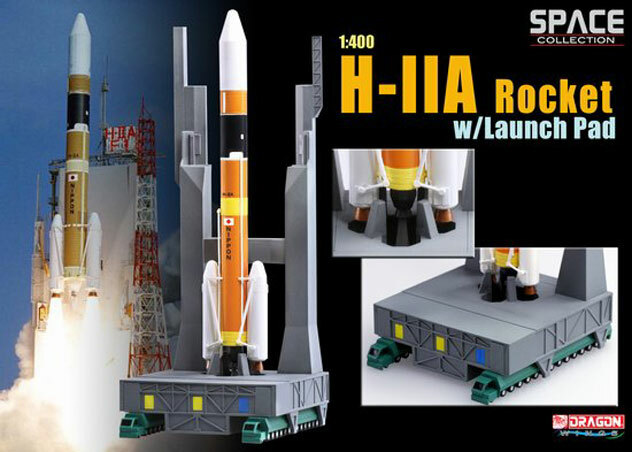 The model is constructed of plastic and metal, highly detailed including display stand. This product was released in December, 2018. 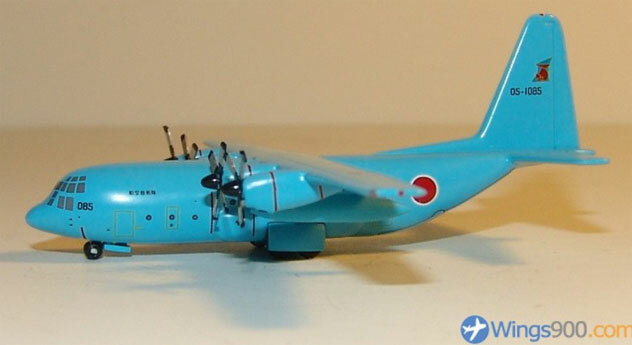 Dragon Wings Models: one limited edition collectible, die-cast military aircraft model in a 1/400th scale of a Lockheed RP-3C Orion in the JMSDF – Japan Maritime Self Defense Force 6th Air Patrol Old 1980s Colors Scheme. With titles Lucifer. Airframe Registration 5078. This model is constructed of die-cast metal with some plastic parts. This product is available beginning in July 2004. 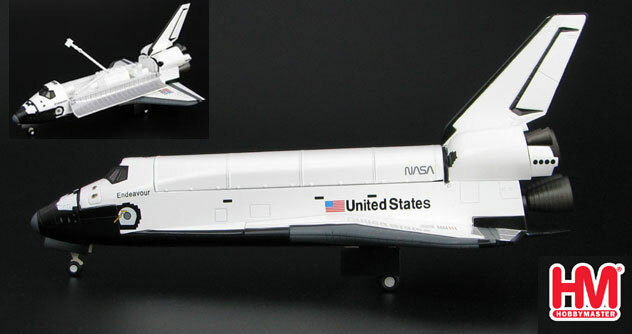 Hobby Master Models: one limited edition collectible, die-cast military aircraft model of a NEW Mold in a 1/200th scale of the Space Shuttle Orbiter Atlantis in the USA – NASA - National Space Administration Original Color Scheme, displayed with or without landing gears, and with moveable Shuttle Bay Doors and Interior Payload Arm. Airframe Registration OV-104. Also, a model stand is included. This model is constructed of die-cast metal with some plastic parts. This product is available beginning in April 2018. 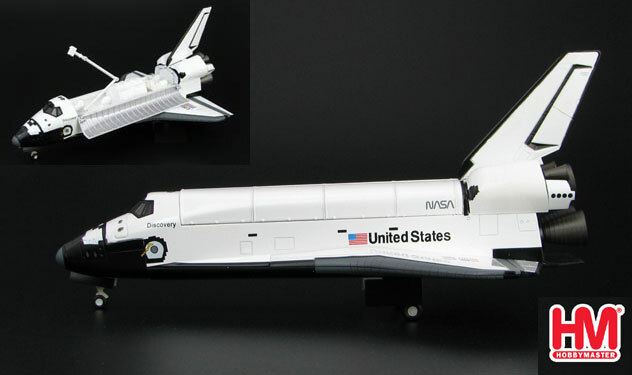 Hobby Master Models: one limited edition collectible, die-cast military aircraft model of a NEW Mold in a 1/200th scale of the Space Shuttle Orbiter Discovery in the USA – NASA - National Space Administration Original Color Scheme, displayed with or without landing gears, and with moveable Shuttle Bay Doors and Interior Payload Arm. Airframe Registration OV-103. Also, a model stand is included. This model is constructed of die-cast metal with some plastic parts. This product is available beginning in August, 2018.